A hormone is secreted from an endocrine gland. Endocrine gland consists a group of secretary cell that is surrounded by a network of capillary. An endocrine gland is also known as “Duct-less gland”. It produces the hormones as a chemical messenger to control the body physiology. Duct-less gland or endocrine gland is also involved in the maintenance of body homeostasis by the rapid change and precise change of physiology. Growth hormone secreted from Anterior pituitary(AP) lobe. Growth hormone is responsible for the growth stimulation. Growth hormone is released from the vessophils cell of anterior pituitary hormone. It is polypeptide in nature made by a long single chain of 191 amino acid. Growth hormone is released from the somatotropic cell so it is also known as somatotropin. The release of the hormone is controlled by hypothalamus releasing hormone known as growth hormone releasing hormone (GHRH) OR somatocrinin and growth hormone inhibiting hormone(GHIH) OR somatostanin. The release of the hormone is regulated by the hypothalamus. When the body required the growth hormone then hypothalamus release growth hormone-releasing hormone (GHRH) that is activate the anterior pituitary (AP) lobe. Anterior pituitary lobe secretes growth hormone then blood level of growth is increased and body use required growth hormone. 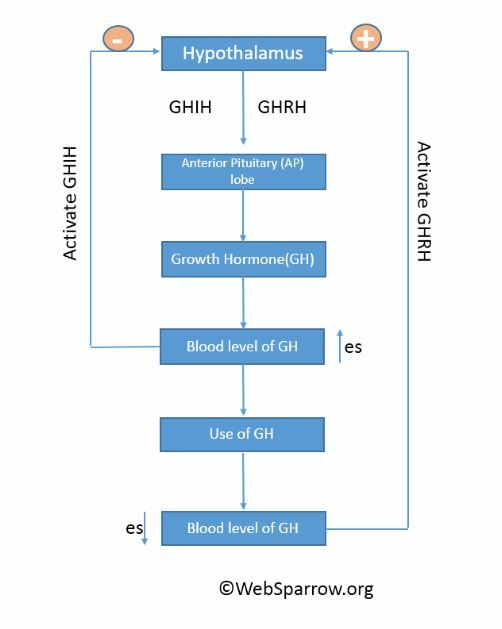 When growth hormone increases more the use then hypothalamus activates growth hormone inhibiting hormone (GHIH). GHIH stimulate the anterior pituitary lobe. Growth hormones help to promote the growth of skeleton muscle and bone. Growth hormone is useful for the retention of nitrogen, water and mineral. Nitrogen involve in the synthesis of amino acid and protein. It is produce by anterior pituitary gland and it is also known as human growth hormone (HGH). Growth hormones also involve in the metabolism process it’s also affect the insulin or blood sugar level. After puberty, the secretion of Growth Hormone is decrease cause Dwarfism. Hypersecretion of growth hormone is cause acromegaly(disturb in bone growth).